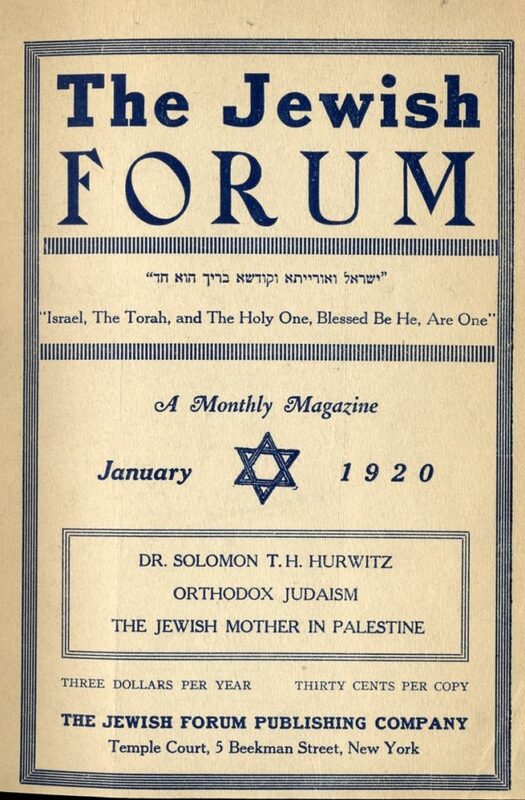 February 2018 marks the centennial of The Jewish Forum, a monthly magazine founded in February 1918 by Dr. Solomon T. H. [Theodor Ha-Levy] Hurwitz. 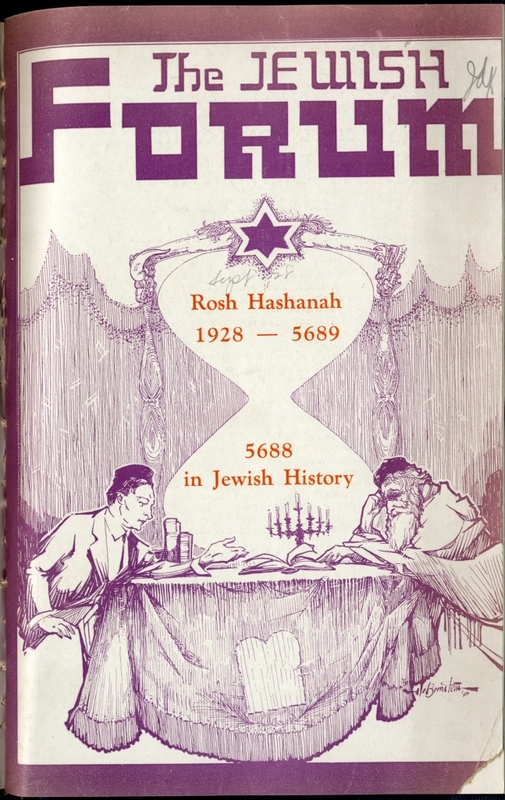 The Jewish Forum covered many Jewish issues of the day from a traditional point of view. Its pages included articles on the growth and progress of Young Israel synagogues and Yeshiva College. It discussed Zionism, including reports on the Hebrew University in Jerusalem. Religious issues such as kashrut and Sabbath observance, the fight for the five-day work week and holding college examinations on the Sabbath, were debated in its opinions and editorials. 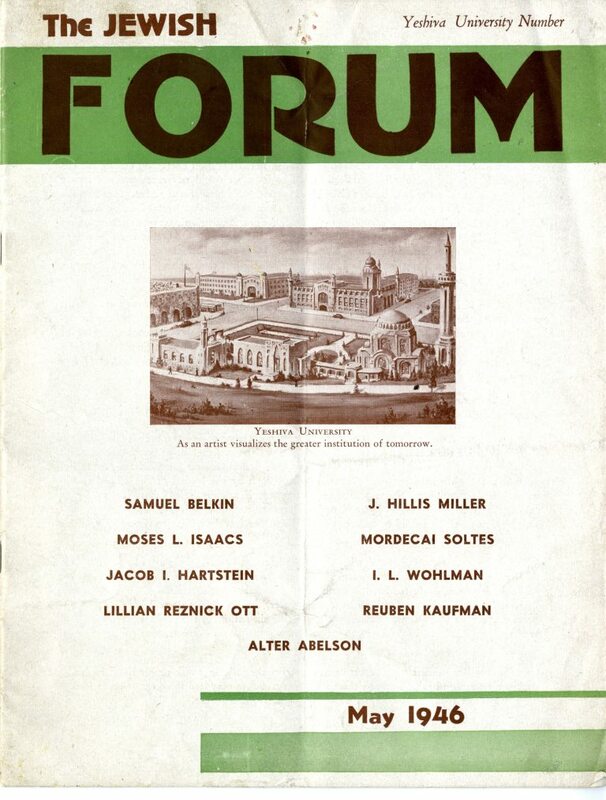 The Forum also featured literary columns, book, art, music, and theater reviews, as well as short scholarly pieces geared for the general reader by Jewish scholars such as Rabbi Dr. Bernard Revel, president of the Rabbi Isaac Elchanan Theological Seminary (RIETS). Dr. Solomon T.H. 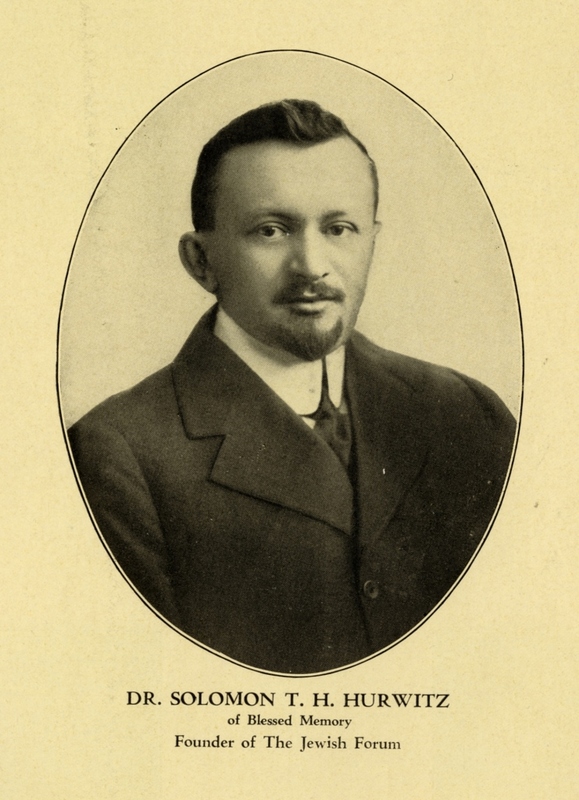 Hurwitz was an outstanding figure in the New York Jewish community of the 1910s. 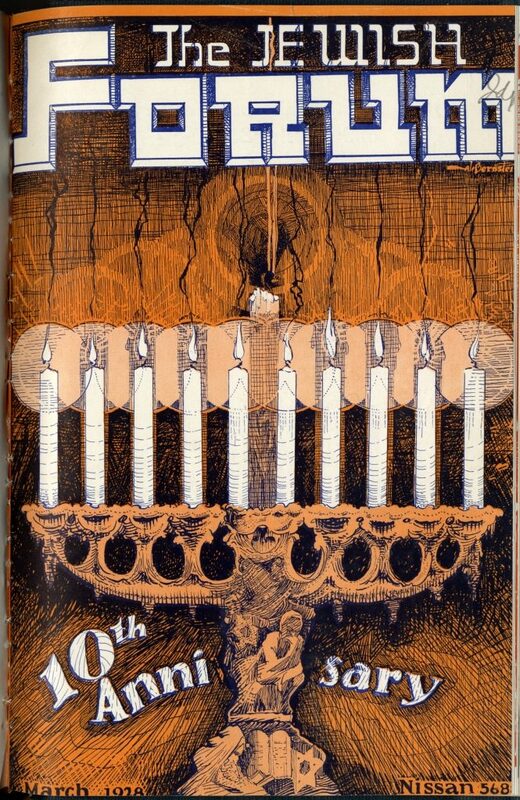 Hurwitz was born in Kovno (Kaunas, Lithuania) in 1887 and immigrated to the United States with his family in 1894. His father, Rabbi Nathan Hurwitz, was the rabbi of the 67th street synagogue (Park East Synagogue). Educated in the New York City public school system, Solomon Hurwitz received a doctorate from Columbia University in Semitic languages in 1912. His doctoral dissertation, published in 1913, was entitled Root-Determinatives in Semitic Speech: A Contribution to Semitic Philology. The manuscript of the dissertation is in the Library’s rare book room. Rabbi Dr. Bernard Revel selected him to be the first principal of the Talmudical Academy, the high school of RIETS. The Talmudical Academy opened in 1916 as a pioneering venture; the only school of its kind in the United States to offer traditional Judaic studies and secular education leading to a New York State Regents diploma. In addition to his innovative work in Jewish education and journalism, he held positions as Librarian of the Department of Jewish Literature at the New York Public Library, taught Semitic languages at Columbia, and later was a professor of Hebrew and Aramaic philology at RIETS. Dr. Hurwitz’s career was cut short by his death at age 33 in 1920, a victim of the Spanish flu epidemic. 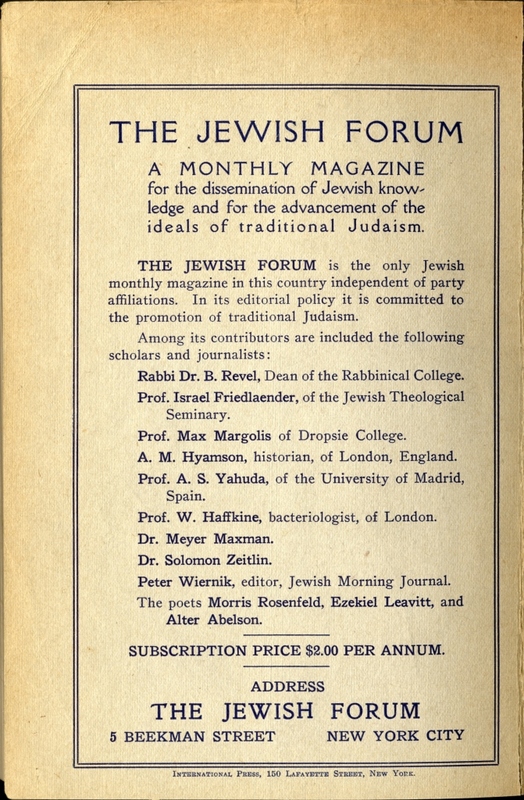 The Jewish Forum ceased publication in 1962.